Once August arrives, this will become your most visited page on the Internet. 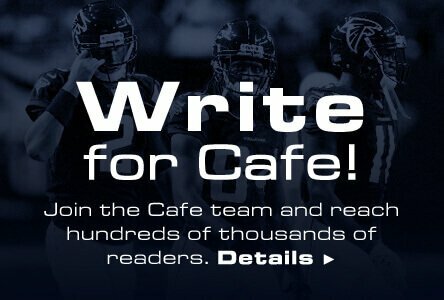 There is no stronger group of writers providing you with daily fantasy football content than the Daily Fantasy Cafe team. Our writers have grossed millions in winnings and are providing you with their strategy and insight to strengthen your game. Become a more successful player by consistently reading, learning and playing. Daily fantasy football is the most popular daily fantasy sport and for good reason. The prize pools are enormous with millions paid out each week of the season. Don't miss your chance at a million. Stay calm and read on. Our top Daily Fantasy Football sites are DraftKings & FanDuel. Latest promotional offers can be found here: Draftkings promo code & FanDuel promo code. For good reason, one day fantasy football is all the rage. Why wouldn't someone want to partake in fun games with the potential to win millions of dollars playing them? If you're an NFL fan, and since you're visiting this page it's a safe assumption you are, what does daily fantasy football have to offer you? The short answer is that fantasy football money leagues have a lot to offer you. The more detailed answer will surely pique your interest. The most obvious thing daily fantasy football has to offer is the chance at winning boat loads of cash. DraftKings ran a weekly tournament, the Millionaire Maker, for the majority of the football season. It cost $27 to enter each week and awarded $1 million to the winner of that week's tournament. In addition to the Millionaire Maker, tournaments that cost less than $27 to enter at DraftKings and FanDuel, as well as a host of others, offered huge cash prizes. It's not all about the money, though. Is your season long fantasy football team failing miserably? Daily fantasy football for money is for you. Are you sick of watching the team you root for in real life get blown out? Rooting for your one-day fantasy football rosters is a perfect cure for what ails you. This year when you get excited about the NFL week you'll have even more reason to be excited thanks to your new companion, 1 day fantasy football. There are generally two types of games that users play when making game selections for daily fantasy football. These are divided into the general headings of tournaments and cash games. The main difference here is the type of payout that they offer. Tournaments give users a chance to turn a smaller entry fee into a massive payday by beating hundreds or thousands of other lineups, while what we call cash games generally give the user a good chance to double or triple their entry fee in a small field and by paying out a larger portion of it. Tournaments are what draw most people to fantasy football daily games. The allure of turning an entry fee as small as a few dollars into a five figure payday can be very tempting. However, these tournaments also often pay just 15-20% of the players who enter it, meaning a lot of the entrants will walk away with nothing, while a select few will walk away with the big bucks. These type of tournaments are great for multi-entering different lineups in order to diversify your action in weekly fantasy football. With the minimum payout being usually two or three times the buy-in, you'd only need to cash a couple of five or ten entries in order to win your money back and only a couple more to make a nice profit. You don't even need to go making wholesale changes to the different lineups you put in. Simply select a few core players and continue to build around them until you have a diverse set of lineups or even use the lineup optimizer on Daily Fantasy Cafe to have it done for you. The biggest thing to diversifying lineups is to play players you expect to do well, not just ones that are different from the guys you feel everyone is looking it. Every lineup can't have every player, so make sure you put together a good mix. Cash games are a much different animal than tournaments. These are usually much smaller fields that will allow you to double or triple your entry fee by beating a smaller percentage of the field. Depending on the site, you'll need to beat somewhere around half the field to double your buy-in in a double-up or 2x game, while the same goes for beating about one-third of the field in a triple-up or 3x game. As the multiplier gets higher, it becomes more and more like a tournament, so it's hard to consider anything past a triple-up in the cash game arena. Head-to-head games and even 3-player games fall into this category as well, but the challenge with these tiny field games is getting true diversity among your opponents. Be sure to track who you are playing and how well you perform against them to keep your game selection advantageous, as that will help you stay profitable in the long run rather than just blindly jumping into a certain number of games per day or slate. Daily fantasy football relies even more on advanced stats than season-long fantasy football as it puts more emphasis on that individual matchup and gameplan for that week than it does the overall talent of the players or team you are selecting. Finding the right advanced stats to use and determining which correlate best with the position you are analyzing are vitally important. There are many sources for advanced stats during NFL season as it's the biggest and most widely played of the fantasy sports. At Daily Fantasy Cafe, we sift through all this information and bring you exactly the stats you need from the best sources around the web. Daily Fantasy Cafe has built the most sophisticated suite of NFL fantasy tools in DFS. Use our NFL Projections to sort, lock, exclude and find the steals of each days draft. Use our NFL Stack Generator to create stacks of players that potentially have the highest upside. Lastly, take your saved NFL stacks and plug them into our NFL Lineup Optimizer to generate hundreds of the most optimal one day fantasy football lineups. There are many more and more accurate advanced statistics out there for offensive players, which is both helpful and frustrating when playing one day fantasy football. It's great to have detailed statistics on offensive players and trends, but what the scoring really comes down to on a given week is the matchups the players face with the defense and those statistics continue to be rudimentary compared to the offensive statistics that seem to pop up in volume by the day. These statistics can be very helpful, especially things like target rates and touchdown rates for receivers, that give us insight into how an offense utilizes its receivers in volume. As well as, red-zone target rates, which tell us which receivers are most likely to receive targets in and around the end zone, leading to touchdowns and ultimately leading to the biggest fantasy point totals. Running backs can be analyzed the same way, knowing which offenses tend to run more and knowing if they are expected to be winning or losing throughout the game. Game flow is a huge boon for running backs as they tend to get a lot more carries killing the clock when their team is winning the game. Using Vegas lines to glean this information can be extremely helpful when selecting running back and is probably more helpful than team tendencies as those tendencies can be tossed out the window when game flow demands it. This isn't as ideal for quarterbacks, as just becuase you are losing doesn't mean you're having any success throwing the ball, as it could be the reason you are losing in the first place. Yes, they'll get more chances when down, but having a capable quarterback to take advantage of those chances is a huge key to selecting a successful field general for your fantasy squad. The other side of this coin when playing fantasy football daily leagues is knowing the weaknesses of the defenses the players are facing. It's one thing to know an opponent gives up a ton of passing yards, but knowing which position is receiving those passing yards is much more beneficial. For instance, over the past few years, the Arizona Cardinals have been excellent defending wide receivers, but have been decimated by tight ends. Their numbers against the pass don't look great overall, so without digging deeper into the numbers, it might look like a great team to play wide receivers against, rather than consistently targeting tight ends against them like you should be. In addition to rankings, tiers and other groupings of players in daily fantasy sports; player types and knowing how to classify them as such can be really beneficial. We'll take a look at some of the types of quarterbacks and how to utilize them to your advantage in daily fantasy depending on matchups and other factors. These are guys like Peyton Manning, Aaron Rodgers and Andrew Luck in 2014. They produced in nearly every game barring injury or something like that and your biggest downside with them other than their massive price tags was them getting out to too big of a lead too quickly and not being able to reach their potential. These are guys you usually want to target against better teams, not necessarily better defenses, but better teams and specifically when they play each other. When two elite quarterbacks like this play each other, it usually results in what we like to call a shootout, with both teams scoring at will and this is an ideal game to target overall for fantasy purposes. These change a lot year-to-year, but in 2014 they were guys like Ben Roethlisberger, Drew Brees, Matt Ryan and Tom Brady. They played pretty well in just about every game, but only turned in a couple of dominant performances despite feeling like they had that upside every week. You could play them for much cheaper than the elite guys, especially if you started playing them at the beginning of a hot streak before their prices rose. These are the quarterbacks that offer the most profit potential, when you can nab something like Roethlisberger's six touchdown game last year for a huge discount from Manning or Luck. This is the most common quarterback type in the NFL right now, including guys like Joe Flacco, Jay Cutler, Matthew Stafford and Philip Rivers. These guys have the potential for massive games, but often let you down rather than reaching it. These plays are generally best left for tournaments, as they will reward you handsomely when they have a great game, but can sink your entire lineup with their low floors in cash games. These are guys like Alex Smith and Andy Dalton. Guys who are going to be really consistently average week to week and will only have one or two really nice fantasy games per season. These guys masquerade as cash game plays often, but are probably overused in general as they don't offer much profit potential and are generally overpriced due to their couple solid games each season and lock-in starter status. Value plays are generally the better cash game option than the game managers as they are usually rookies, other your players or injury replacements and come at a pretty steep price discount from the game manager types. The great thing about quarterbacks is they almost always play four quarters and don't rotate at all like other positions do, that means you're getting similar “opportunity" from a value play that you do from an elite option and are paying just a fraction of a price. Running backs, much like quarterbacks, fall easily into types that help you decipher what kind of games and lineups you should be playing them in. Running back is a very volume based position and that volume will quickly affect what type they fall into. Some of the running back types are almost unusable, while some of them will fall into near must-play range. These are running backs that are involved in every facet of the game, from carrying to blocking to pass catching. They play on nearly every play and provide the highest-floor of any running back type by far, but you certainly have to pay a heavy price tag for these guys. Matt Forte and Le'Veon Bell were two major components of this group last year. These guys become even more valuable in point per reception scoring as it leads to better floors and higher upside. These are guys like Arian Foster, who was was a rock solid option last season volume-wise nearly every game he suited up for. He was nearly a lock for 20+ carries with a couple catches, but not playing in an offense with the firepower of a team like Forte and Bell played for cost him dearly at times. If the Texans were down his carries were a bit curtailed and if they happened to be up, most teams knew the run was coming and stacked the box. This problem creates a massive divergences among results at the top and bottom end from the above group. These are guys that play in great offenses. They might not be elite speedsters with big play potential or guys that catch a ton of passes, but they provide a ton of value thanks to consistently being in scoring territory and on the field when the team is calling running plays. Two great examples from 2014 were Eddie Lacy and Marshawn Lynch. Each player struggled at times last season, but in the end, scoring well into double-digit touchdowns was huge for them and their fantasy value. These are guys you almost have to avoid most of the time. Think DeAngelo Williams and Jonathan Stewart over the past couple seasons. Both have been valuable at different times, but it's almost always been due to the other one being injured and that's how you have to approach these backs. They are splitting everything nearly 50/50, so even in a good matchup, you're only getting half the touches from them, giving up half the opportunities for a big play, which can make or break a guy's' fantasy day. It's easy to forget these guys have talent when the raw totals aren't there, but the quicker you bought into Jonathan Stewart with DeAngelo Williams out last year, the most money he made you. These aren't quite as reliable as quarterbacks as running back is the most rotated position in fantasy and a player can always lose reps to the guy behind him at any time during the game. However, when there's a clear-cut backup getting starters reps, he's almost always the best value play of the week. A great example of this last season was Jeremy Hill, who stepped in for Gio Bernard due to injury and took off with the job and never gave it back. Even in some of his worst games early on, he provided excellent fantasy value for his price. NFL training articles and videos to help you win more. © Copyright 2019, Daily Fantasy Cafe, Inc.